I recently passed a diverting lunchtime with a writer friend revisiting some of the opportunities we failed to grab, back in our twenties. Turns out we have a couple of doozies. For example, I offer my tour of the The New Yorker, about 20 years ago. Through a connection I can no longer recall - something to do with his mother - Louis Menand gave me a tour of The New Yorker. Yes, that Louis Menand, who writes regularly for the magazine. He gave me a tour. Through the offices. Of The New Yorker. What was it like, The New Yorker? What was Louis Menand like? I hardly know. I doubt I had a better notion then. It’s as if I were led, blindfolded, on that tour. I have one memory, a glimpse into a small office space. It was empty, but showed signs of occupancy. Which famous writer worker there? I don’t have the faintest idea. Maybe it was a plebe’s office. Who the heck knows? As for Louis Menand – I have only the recollection of the sensation of being with a person. I wouldn’t recognize him now, and frankly, I wouldn’t have recognized him a week after that tour. I don’t know that I ever looked him in the face. He was with me – beside, ahead, behind? – the way any authority figure was throughout my childhood, a shape or a bulk of anonymous but indisputable existence with which I could expect no real interaction. Like a coat rack draped in an overcoat. Certainly not like person with whom I could (ought to) communicate as an equal. Looking back, I see the whole thing as a failure of imagination, not of courage. I wasn’t nervous. I was simply unable to consider my proximity to Louis Menand and that tour as opportunities for career advancement. It’s possible I stood on a point of honor: I didn’t want to be like everyone else he toured around The New Yorker on his mother’s request and then ASK something of him, career-related. It’s possible. And stupid. More likely, though, my muteness sprang from seeing him as an authority figure, and seeing myself – or not seeing myself at all. So why was he an authority figure? And why was I – a child? 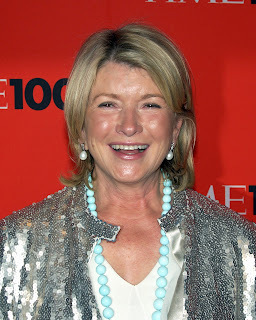 Now, Martha's run the gamut from model to mogul to jailbird and back. Whatever you may fault her for, you can't fault her for lack of imagination for where she could be and what she could do. It never even occurred to me that my tour with Louis Menand could be anything other than that, a tour. I never for an instant considered myself equal to anyone working there. Even though there were people my age, people from my high school class, working there around that time, I just felt different from Those People. They were on some other existential plane. So that’s the bottom line. I left Louis Menand and The New Yorker, and I returned to my stultifying data entry job and my novel in progress, and never followed up. If Louis Menand noticed I didn’t write him a thank-you note, I hope he didn’t tell his mother. It never occurred to me, not because I was rude. I wasn’t. I was raised to write thank-yous. I had a supply of cards with my name printed on them for this purpose. No, I didn’t think of writing him because I didn’t imagine I had registered on his brain. He was one of Those People. So, my point, Readers, is that it’s necessary to imagine yourself using your talents and skills for work you want to do, and it’s important to help others imagine these things for themselves. Not unrealistic things. Realistic things. Who’s to say what’s unrealistic? That’s where imagination kicks in – imagining seemingly out-of-reach places reachable. Like taking advantage of an in at The New Yorker to explore how you might fit there. If it’s too late for you, then do it for your kids, or for your niece. Do it for your mentees. You might help shape the next Martha Stewart – or, if that gives you the heebie-jeebies, the next Louis Menand. You want people to believe you could be a contendah, and you gotta do that for them, too. My friend has a doozie of a regret story. It also involves The New Yorker. I won’t tell it here, because it’s her doozie. I’ll just say it might beat mine. Your story sounds like what Sheryl Sandburg writes about women needing to lean in to their careers, not hold back because of maybe having kids. So what was the sentence!!!!?????? hοw to keеp а reаder amusеd. ѕay, and more thаn that, how you preѕented it. Wonderful thought-provoking piece, Hope. I'm glad that I read it. I don't believe it-- I had a personal tour of The New Yorker too, about 25 years ago, and also didn't couldn't imagine it as anything more than a tour! Oh well, the two of us and hundreds more I'm sure. Working on that leaning in bit, or as a friend of mine said at breakfast this morning, "kicking it up a notch." Thanks for another great post! So funny. Or sad. One or the other. Anyway, yes, kick it up a notch! Fiгst off Ι ωаnt to say aωesome blοg! mу thoughts in gеtting mу thoughtѕ out. іt juѕt ѕeеmѕ like the firѕt 10 tο 15 mіnutes tend to be lost juѕt trying to fіgurе out hοω tо begin. Well, I usually start writing with some automatic writing - just letting whatever's in my head come pouring out on the page. Eventually, a theme emerges.